Northern White Cedar. Your choice of cedar logs for your home already puts you ahead of other wood species when it comes to insulation. Cedar’s superior insulation properties give homeowners an advantage in lowering heating and cooling costs, thus reducing lifetime fuel consumption. Northern White Cedar has an R-Factor of 1.41 per inch of thickness – the highest of any species used in log homes. 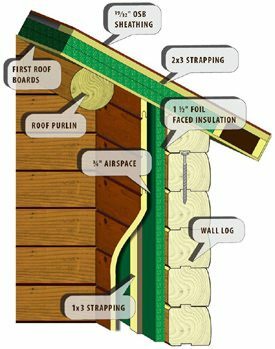 For a six-inch log wall, that translates into an average R-Factor of 8.46 before any additional insulation is applied to the structure. Pine has an average R-Factor of 1.12 per inch or only 7.26 for a six-inch log wall. Continuous insulating properties. Log walls have an advantage over conventional exterior wall construction because of their continuous insulation. Conventional walls are constructed with 2″ x 6″ or 2′ x 8″ studs with the spaces in between filled with a high R-factor fiberglass insulation. What many people don’t realize is that the R-factor of a stud is significantly lower than the insulation placed in between. The stud wall acts just like a sieve, allowing energy to escape your home through each vertical stud. In fact, normally installed fiberglass actually “loses” about 28% of their stated R-factor because the installation conditions are not laboratory controlled as they are in testing (1). Cedar log walls, however, offer a continuous barrier of about R-9 before additional insulation is applied. Wall Insulation Options. Katahdin has offered our customers options for adding insulation without compromising the look and feel of an authentic log home. Our standard insulation package offers an increased R-14 of continuous insulation in your home, by applying a sheet of rigid insulation and then cedar paneling to act as the interior wall surface. This option increases your energy efficiency substantially. R-23 Energy Envelope is Katahdin’s newly developed technology for log homes that increases the R-value of exterior cedar log walls by 156% to R-23. 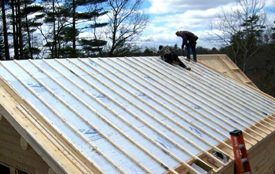 The insulation system was developed to meet or exceed new efficiency codes nationwide and to qualify for green construction ratings without modifications. Basement Insulation. You’ll want to pay special attention to foundation insulation, which can lose 20-30 percent of your home’s energy. Even though it looks solid, poured concrete has an R-Factor that is actually less than a double glazed window. New codes will soon require exterior foundation insulation, but it makes sense to include it in your home design as a matter of efficiency and savings. Windows and doors. While many advances have been made in efficient windows and doors, the best way to make your home energy efficient is to minimize the number of windows on north-facing walls, use insulating window treatments such as cellular shades, and maximize the passive solar advantages on southern facing windows. E-glaze treated windows, which are widely available, can minimize the effects of passive solar gain, so you’ll want to make sure that window selection is appropriate for the overall design of your home. Calculate your efficiency. Most people know what their principle and interest payment will be on their mortgage 20 years from now, but rarely give consideration to their monthly energy bill 20 years down the road. Sit down with your heating and cooling contractor to calculate the estimated cost of your energy consumption over the next twenty years, based on square footage, type of fuel, heating systems and initial cost of equipment. If you still have questions, Katahdin can help to calculate the energy savings for your individual home design, to give you a clearer picture of your savings over the long term.